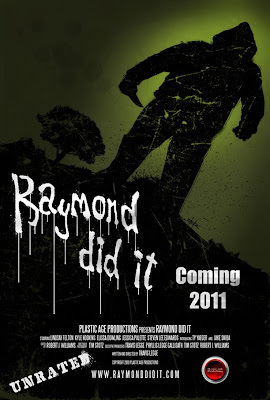 Plastic Age Productions is pleased to announce that indie slasher film Raymond Did It has been acquired for international distribution by R Squared Films! Filmed in June of 2010 and released in limited theaters in 2011, Raymond Did It is an 80’s style slasher film. Starring Lindsay Felton (VH1 Scream Queens, Caitlin’s Way), Jessica Palette (Vh1 Scream Queens, Under the Raven’s Wing), Elissa Dowling (Dahmer vs. Gacy, Dread), and introducing Kyle Hoskins as Raymond, Raymond Did It has received critical acclaim and overwhelmingly positive response from fans. Raymond Did It was written and directed by Travis Legge, shot by Director of Photography Tim Stotz and edited by Robert J. Williams. Raymond Did It also stars Steven Edwards, Jake Skiba and Ty Yaeger.